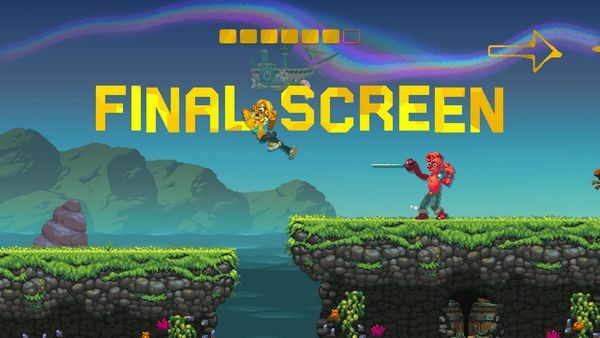 If the first thing you look for in a review is a score then you might be a little caught out here, as applying a definitive rating to Nidhogg 2 is nigh on impossible. For everything we can describe about the game itself, its appeal is directly related to the number of people playing it. 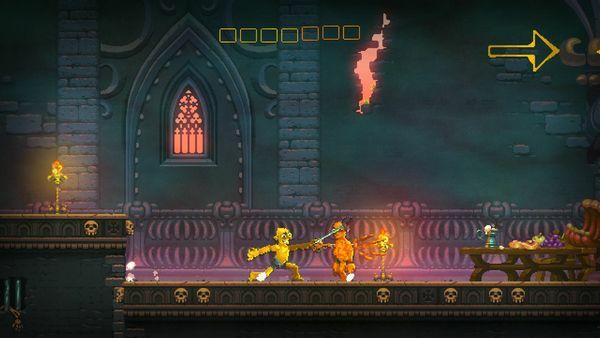 Nidhogg 2 follows the template of it’s minimalist original – two fighters duelling, seeking to advance into each other’s territory across a span of rooms, with the winner being the one making it to the far end and thus being eaten by a giant snake – Nidhogg itself, a creature from Norse mythology. The original didn’t rely on flashy graphics, and the fighters had a minimum number of moves, but this lends itself to something extremely balanced, and has even been played at pro fighting game tournaments such as Evo. This sets the sequel a difficult challenge – to add new elements without upsetting the balance. The first change that will jump out are the updated graphics – gone are the monochrome fencers of the original, replaced with colourful monstrosities that look like they’ve been designed by someone with a flair for the grotesque. There will likely be an immediate “like it or hate it” reaction to them, though while my first reaction was negative they grew on me after playing for a while, as their appearance adds a necessary cartoony feel to their regular deaths. The environments have likewise been given several coats of paint, filling out to become castles and dungeons, airships and swamps, and even cloudscapes in the skies lit by rainbows. It adds a lot more depth to the settings, although with occasional hiccups if entering a new screen can leave you having to quickly find your character against an overly detailed moving backdrop. The fencing rapiers of the original are back, with fighters picking a height for their blade – low, middle at shoulder height or high at eye level – to jab at their opponent, either resulting in an instant kill, clashing blades, or possibly a disarm… where combat is still possible with trips and dropkicks. And if that wasn’t enough, you can also throw your weapon to try and surprise your opponent. Several other weapons are now added to the mix though, with broadswords allowing for heavy overhead strikes or low upward swings, daggers good for throwing or a quick – if dangerously close – stab, and bows because… well, they’re in there. For a game with a reputation for balance, the bows can be generously described as a “curious addition”, as you’re more likely to find yourself running away from your opponent in the faint hope of getting a little distance to use the thing properly; it’s telling how quickly players in online games disable it in the pre-match settings. There’s something on your foot… The various deaths are comedically OTT, and which can help you warm to the art style. Beyond the actual fighting, gameplay works much like a tug-of-war. Play begins in the middle of several rooms; after one player has died, the other gets given advantage and can begin advancing on their opponent’s end – usually getting a little distance before their opposite number respawns, attempting to get a kill and take the advantage themselves. This back-and-forth is often punctuated by players falling down pits, sprints as one tries to avoid the other other, or just pausing in areas where both sides seem to hold ground better than advance beyond it. And… well, that’s kind of it. Except, not at all. The whole experience can feel pretty frenetic, but a sense of strategy does develop – whether to fight or risk jumping over your opponent; when it feels best to throw a weapon and hope they don’t block it; if you should hold high ground and make them try to come to you or rush at them in the hope of causing a mistake. The different weapons all have a different feel too, both like against like and when mixing and matching styles. 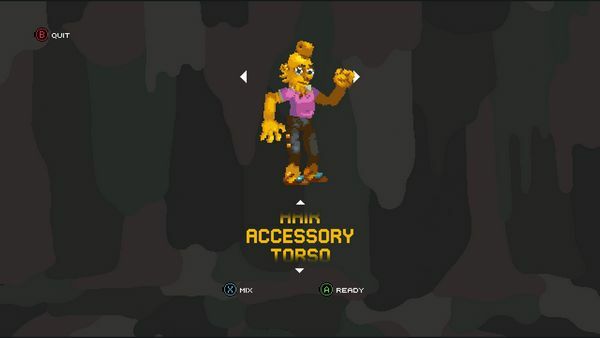 Character customisation; you can select options in a lot of areas, but you’ll never be more than grotesque. However, it can also feel a little flat all on its own. The game supports single player against the computer, local and online multiplayer, and here’s where we get back to the problem of giving the game a score. You see, as a single player experience, it’s just not that satisfying. The AI can give you something to play against, but it misses giving you motivation to want to – beating your opponent gives you no sense of reward, and the arcade mode feels more like a way of learning the game mechanics before playing human opponents… except without any real guidance on how to play. It’s bland, and little more than a learning by doing process. Online multiplayer is a big step forward, when you know there is a human being with their own strategy out there working against you. It can be a little remote, because being one on one you’d like to think it’s slightly more personal than just facing a screen, except that’s all you’re doing. Even so, there were moments when, win or lose, something would happen to tip a deadlock and I’d raise a smile. It’s that sort of experience, with satisfaction at seeing the whole thing progress, or clawing defeat from what had felt like certain victory. But the process isn’t perfect, with my experiences of online play encountering lag varying from a sense that things weren’t perfectly syncing between input and effect, to the game causing one or other player to exit the pre-game lobby; which, depending on the time of day you’re looking to play, you may not even get to – there were often times the game just didn’t find anyone else looking to play. So, fun with some mixed results. No, it’s a game designed as local multiplayer, ideally with as many people ready to have a turn as you can get, the kind of game that will get raucous cheers from onlookers for a decisive move, groans as both players manage to die at the same time, raised spirits as someone makes a dash for victory… it’s a game to play on a personal level, a game where your opponent should be somewhere close enough to share the experience of playing. 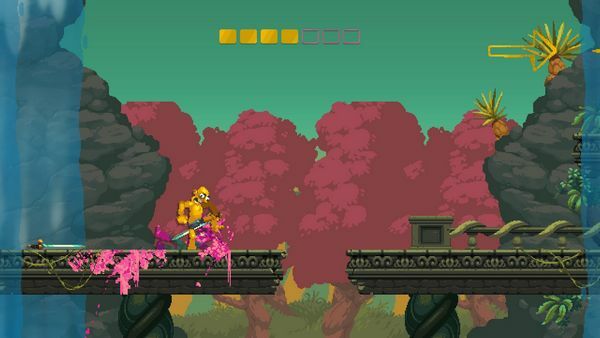 And yes, the basic argument stands that every multiplayer game is better when played with friends, but it’s hard to imagine Nidhogg 2 carrying the same feel even if you were playing a friend online while chatting… it feels built for local play, which carries the power to make it both one of the greatest games you’ll play this year, and one of the more disappointing ones. As said, you get more out of it the more people are jumping into it. After the sharp, minimalist graphics of the original, the design of the sequel can be a touch unsettling, but they fit the cartoonish violence and overall energy the game wants to share. But the game doesn’t have enough to share on its own to make it a winner, and experiencing it with others – online if necessary, in person ideally – is the key to enjoying what is there. If you really want to put numbers on that… as a single player game, it’s around 4/10, due to an unsatisfying process of running against AI; for online play, it ticks up to a 6/10, when the satisfaction of a human opponent is offset by just how impersonal playing this way is; but for local play, it’s going to hit 8/10 – at least – just for those moments when groups of people are able to cheer and jeer as the advantage keeps changing hands at high speed.